A breakthrough survival game, plus it was free this year. 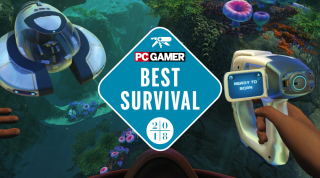 Underwater survival game Subnautica—just given away for free on Epic's Store—is next on our list of GOTY awards. If you'd like to see the complete line-up of awards so far, head here. Andy K: I don’t get on with a lot of survival games because, outside of staying alive, there isn’t much to do. But Subnautica’s beautiful, mysterious alien ocean is absolutely heaving with interesting, hand-crafted details to discover. When you find a strange island or a wrecked ship, you know there’ll be an interesting story attached to it, and maybe something that can be scavenged to help you out. And while many survival sims force you to endure hours of tedious busywork, the material requirements for building things in Subnautica are refreshingly generous, letting you actually get on with enjoying the game. Pip: Subnautica is my most-played game of 2018. It’s actually the only survival game I’ve ever loved. The underwater setting is absolutely gorgeous, and does a fantastic job of making you want to explore. I wanted to see what was in every cave, and round every corner. Each new biome was a source of utter delight as well as tension especially when I was in the depths of the ocean, battling oxygen limitations and deep sea pressure (as well as terrifying creatures) in my quest for resources. Steven: I'm with Andy on this one: Survival games bore me to tears. But Subnautica succeeds on the sheer splendor (and terror) of its open sea. I've never felt such a palpable sense of dread as when I would venture into some uncharted part of the ocean where any number of aquatic horrors could get me. My first encounter with a Leviathan left me so shaken I put down the game for days, but the thing that kept me coming back was the story. Subnautica displays a rare feat of storytelling in the way pivotal plot moments happen completely independent of your involvement in them. The three of us each had a wildly different perspective on an early plot beat, and that wouldn't have happened if Subnautica was the kind of game that had to wrest control away from the player to make sure they noticed every detail. Like many of its ocean creatures, Subnautica is a game that feels like it's indifferent of me as the player, and that makes me all the more interested in puzzling its story out. Fraser : Subnautica is really a horror game. Sure, it’s a very fetching horror game that’s serene and lovely for long stretches, but that’s how it gets you! And before you know it, you’ve boldly floated out into an interminable abyss where titanic, mountain-sized aliens dwell... and you’re running out of oxygen. There are horrible things living in the depths, hungry leviathans, but even seemingly friendly fish are actually bastards. I followed one scaley trickster to my doom when I chased it into a labyrinthine network of caves. I enjoyed spelunking at first, but then it dawned on me that I was utterly lost and the caves were going to be my tomb. Instead of big monsters jumping out from behind rocks, Subnautica terrifies with the awe-inspiring scale of the ocean and its largest beasties, and it constantly reinforces the fact that you don’t belong there. Read Pip's review of Subnautica.